The Laurentian Tiger Beetle (Cicindela denikei) has a limited range globally and is known only from Ontario, Manitoba, and Minnesota. Until recently, this species was only known to occur northwest of Lake Superior, but recently this species was discovered on Manitoulin Island in southeast Ontario (Pearson et al. 2015). This species was first discovered in Minnesota in Lake County in 1958. By 1979, it was known from five locations, four of them in St. Louis County. Given this restricted distribution in the state, the Laurentian Tiger Beetle was listed as a threatened species in Minnesota in 1996. Concerted survey efforts since 2000 have discovered the species in an additional 50 or more locations in Cook, Lake, St. Louis, Koochiching, and Lake of the Woods counties (Steffens 2000, 2001; R. Huber, personal communication). Despite being documented in many new locations in the state, this species apparently occurs in Minnesota only north of the Laurentian Divide (Border Lakes, Littlefork-Vermilion Uplands, and Agassiz Lowlands subsections). Because it is now known to be more widespread in Minnesota than previously thought, the species’ status was changed to special concern in 2013. 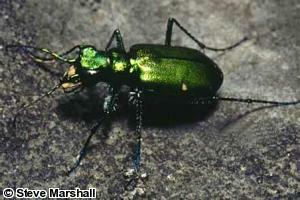 Adult Laurentian Tiger Beetles are bright metallic green to blueish green (Pearson et al. 2015). They average 13-15 mm (0.51-0.59 in.) long and have quick escape flight capabilities. There are no other tiger beetles that live in this species' northern Minnesota habitat that resemble it. However, the closely related Six-spotted Tiger Beetle (Cicindela sexguttata) looks nearly identical and occurs in the southern two-thirds of the state. Tiger beetle larvae are mostly white and somewhat grub-like (Pearson et al. 2015). The portions of their bodies that are exposed in their burrow entrances are usually the same color and texture as the surrounding soil surface allowing them to blend in with the soil (Pearson et al. 2015). Tiger beetle larvae have eyes with dense photoreceptors that give them detailed focusing ability and three-dimensional visual perception (Pearson et al. 2015). The Laurentian Tiger Beetle prefers openings in northern coniferous forest; these include in abandoned gravel and sand pits, undisturbed corners of active gravel and sand pits, sand and gravel roads, and sparsely vegetated rock outcrops. This species has also been observed along power line corridors. Adult Laurentian Tiger Beetles emerge in early summer (sometimes as early as late May) and begin feeding, mating, and laying eggs. By mid-summer (late July, sometimes mid-August), the adults begin to die-off. Tiger beetles prey on small insects and other arthropods and are visual hunters. Adults will actively chase down their prey but will also wait in a shaded area and pounce on prey as it wanders by (Pearson et al. 2015). They often chase their prey in short, fast bursts with brief stops in between runs. These stops are necessary for orientation as tiger beetles can run so fast that they cannot see the prey they are pursuing. The colored front wings (elytra) of tiger beetles are hardened protective coverings for the abdomen. The transparent hind wings are the flight wings and are folded beneath the elytra when the beetle is not in flight. The elytra do not contribute to flight but are held out of the way of the hind wings. When disturbed, tiger beetles may take short, low flights to escape. These escape flights and the ability to run quickly are their main defenses against predators. Tiger beetles are also usually well camouflaged in their environment. Tiger beetle larvae dig burrows in which they live and secure prey. They are ambush predators that lie in wait at the top of their burrows with their jaws open and their heads and thorax flush with the ground surface, essentially filling the burrow entrance and disguising their presence (Pearson et al. 2015). When prey is within reach, the larvae anchor themselves to the sides of the burrow by two pairs of hooks on their lower backs and quickly lunge out and grab the prey with their mandibles. The struggling prey is then pulled into the bottom of the burrow and eaten. When they are done eating, the larvae carry the indigestible portions of the prey to the top of their burrow and throw it backwards away from the burrow entrance. The larvae also use their burrow for protection and will retreat into its depth when they sense danger. Larvae primarily use vision to detect danger but may also sense vibrations in the ground created by large predators. Burrows are found in sandy and gravel soils and may extend under flat rocks. Burrow depth is 10-20 cm (3.9-7.9 in.) (Pearson et al. 2015). Constant vehicular traffic along roads that act as corridors for this species may reduce local populations (dead, crushed adults have been found along such roads). Surveys have resulted in over 50 new locations for this species in Minnesota, some of which are protected on state lands. Brown, W. J. 1934. New species of Coleoptera V. The Canadian Entomologist 66(1):22-24. Freitag, R. 1999. Catalogue of the tiger beetles of Canada and the United States. NRC Research Press, Ottawa, Ontario, Canada. E-book. Pearson, D. L., C. B. Knisley, D. P. Duran, and C. J. Kazilek. 2015. A field guide to the tiger beetles of the United States and Canada: identification, natural history, and distribution of the Cicindelinae. Second edition. Oxford University Press, New York, New York. 251 pp. + plates. Steffens, W. P. 2000. Status surveys for the sensitive species Cicindela denikei and other tiger beetles of the Superior National Forest. Report to Superior National Forest, Duluth, Minnesota. 24 pp. Steffens, W. P. 2001. Status surveys for the sensitive species Cicindela denikei and other tiger beetles of the Superior National Forest. Report to Superior National Forest, Duluth, Minnesota. 13 pp. + figures. Wallis, J. B. 1961. The Cicindelidae of Canada. University of Toronto Press, Toronto, Ontario, Canada. 94 pp.